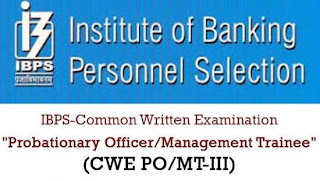 IBPS CWE PO/MT Exam 2013: Institute of Banking Personnel Selection (IBPS) has issued Recruitment Notification 2013 on 17th July 2013 for Common Written Examination (CWE) for Recruitment of Probationary Officer (PO) / Management Trainee (MT) in participating Organizations. 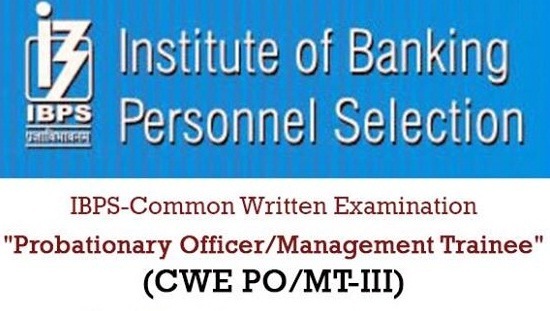 The next Common Written Examination (CWE PO/MT-III) as a pre-requisite for selection of personnel for Probationary Officer/ Management Trainee posts in the Participating Organisations listed below will be conducted online by the Institute of Banking Personnel Selection (IBPS) tentatively in October 2013. Educational Qualifications: Degree (Graduation) with 60% (55% for SC/ST/PWD) marks in any discipline from a recognized University or any equivalent qualification recognized as such by the Central Government. Candidates belonging to SC / ST/ PWD categories filling in “unreserved” vacancies will not be entitled to the relaxation of 5% marks mentioned above. Age: 20-28 years, relaxation as per norms. IBPS CWE MT/PO 2013 Admit card Download: 7th October 2013 onwards.